Apple Jill handmade soap smells just like warm apple cider fresh apples, grapefruit, orange rind, cinnamon, cloves, spices and vanilla. It is a warm comforting scent and makes a perfect unique gift for birthday, anniversary, bridal or party favors. Apple Jill handmade soap smells just like warm apple jack cider . The scent is a like fresh apple jack with notes of grapefruit, orange rind and a warming spice blend, topped with vanilla. This artisan soap smells so good you will think someone is baking. It is made using the cold process method. I combine natural vegetable oils like olive and coconut, mango butter, beeswax and pure water, then add scent and color. Apple Jill handcrafted soap has a warm comforting scent that will remind you of warm holidays with the notes of apple, cinnamon, cloves and orange peel. This hand crafted soap is a real down home winner in your shower or tub! Gorgeous swirls of green and brown add an extra appeal. All of Ginger's Garden soaps are at least 7% superfatted. This gives our handmade soaps their gentleness and mildness. Please keep all handmade soaps on a well drained soap dish so they last longer. 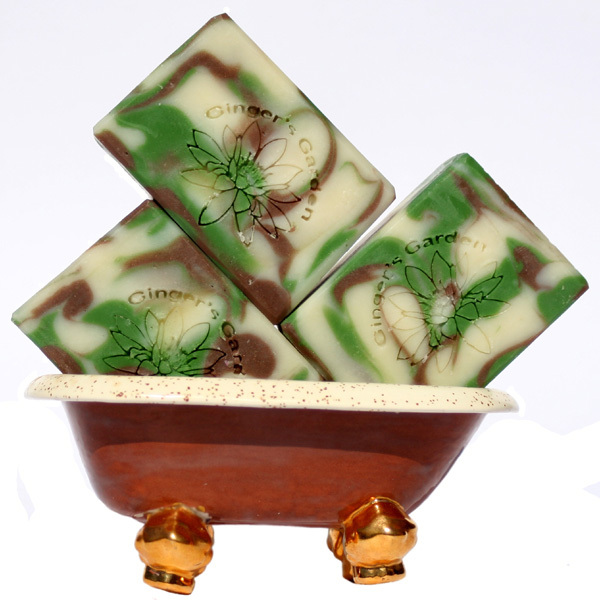 Caress your skin and uplift your spirits with this fruit and spices hand crafted soap. Perfect for a man or a woman, but please share. It is perfect for the holidays, but use it anytime. Ingr: Olive, Coconut, Palm Kernel, Mango Butter, Castor oil, Soybean, Sodium Hydroxide, Beeswax, sodium lactate, Scent blend, mica, spices and Montmorillonite Green Clay from the Coso Mountain region in California.